Greenough is a historic settlement situated in a floodplain 400 kilometres north of Perth, Western Australia and 24 kilometres south of Geraldton on the Brand Highway. 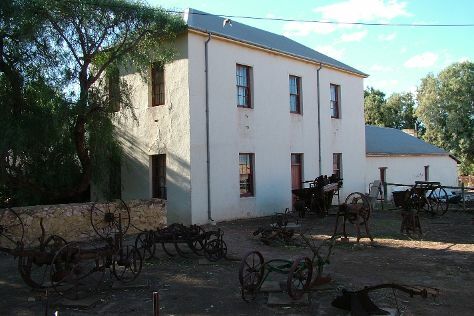 The settlement's historic buildings are mostly built of local limestone and date to the second half of the 19th century; and a sizeable collection of these are owned and managed by the National Trust of Australia. A remarkable feature of the Greenough Flats are its windswept trees, some of which are bent a full 90 degrees due to the unrelenting coastal winds.The mouth of the Greenough River is about 10 km to the north of the town.Aboriginal HistoryThe fertile land was once the home of the Yamatji people, who lived a fairly sedentary life, subsisting on fish and water fowl from the river mouth, shell-fish from the coast and game from the hills. They also cultivated ajeca, a yam-like plant on the river flats.A popular camping ground was what is now known as "The Bootenal Springs". This is a permanent source of water and became a place of conflict between the Aboriginal people and the first European settlers. Although no evidence of the conflict remains, the site has since been interpreted to remind people of what took place.European HistoryThe area was first explored by George Grey in 1839 after which he named the area after Sir George Bellas Greenough, the president of the Royal Geographical Society in London. Grey claimed that the area could become the granary of Western Australia. Greenough is in Western Australia. Plan the details of your Greenough holiday and any onward adventuring with our easy-to-use Australia online travel route planner .